Georgia O’Keeffe (1887-1986) was the first American woman to really distinguish herself as a modern artist, paving the way for other women. My mother, who is a watercolorist, introduced me to O’Keefe’s work when I was a child. She particularly liked O’Keefe’s large paintings of flowers. I love them too. 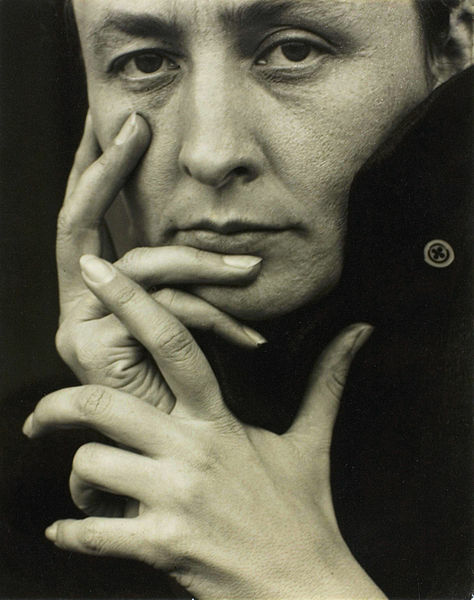 O’Keeffe, who married photographer and gallery owner Alfred Stieglitz, had an interesting and unusual life and a long career. You can read more about her and see her work at the Georgia O’Keeffe Museum site HERE. She truly used painting as a form of expression, and that is reflected in her quotes below. I often painted fragments of things because it seemed to make my statement as well as or better than the whole could. Marks on paper are free – free speech – press – pictures all go together I suppose. Nobody sees a flower really; it is so small. We haven’t time, and to see takes time – like to have a friend takes time. One cannot be an American by going about saying that one is an American. It is necessary to feel America, like America, love America and then work. From what I’ve read about O’Keefe, it is hard to imagine her being terrified, like she mentions in the first quote. But if she was, she certainly a role model for not letting our fears get in the ways of our successes. This entry was posted in The Quotable Nerdy Chick and tagged American female quotes, brainy women quotes, female artist quotes, Georgia O'Keeffe Quotes, smart women quotes.